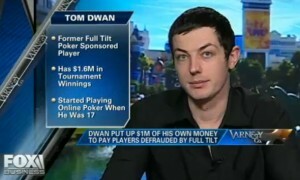 The famous poker player Durrr was interviewed about the scandal that has hit full tilt at this time, particularly with regard to Black Friday. Through the 2 +2 forum American, was published a video that we want you back at the end of article that shows the interview in English of course the famous poker player. The channel that broadcast the FOX interview, including questions asked, Full Tilt is the most interesting was a Ponzi scheme? Durrr’s answer was a company is badly managed, there has been some serious errorsfor this reason it has come at present, is serious not to have enough money to pay players, is almost a real lost for a ride . I do not think that players are happy to know that maybe will get back their money, the fate of their funds is uncertain! Whatever happens, hopes to review the funds have lost a few, short, a pretty tough nuts to crack in this case a good hand to play! A hand that has cost the portfolio of manyvirtual users. Flavio Ferrari leaves Zumbini Full Tilt!